Also known as, Cooking Zucchini without a Recipe. A lot of people enjoy cooking. I'm not one of them. But every now and then I get inspired, and I whip something up. And maybe for my other kindred spirit non-cooks, this side of cooked zucchini will give you something to try. Today I decided to call my method "Abstract Cooking". But really, it's just the old-fashioned way of opening up the frig or pantry, and throw a couple of things together. But I think Abstract Cooking sounds fancier. I had this epiphany after a chat with my awesome cooking cousin Alanna (whose own oven timer went "beeeep" near the end of our call, baking some yummy sounding baked bean dish). I looked at the fresh zucchini on the counter and the leftover bacon bits/grease in a pan, and I thought -- hmmm, sautéed zucchini in bacon fat, how bad could it be? I also tend to cook by smell. If I think certain smells will go together, then my logic is the taste of all those smells should also go well together. No doubt there are plenty of instances where that theory could be proved wrong, but so far, I've been ok with it when freestyling without a recipe. Like today—zucchini, bacon, shallot, and garlic smells definitely go together! Cut up some shallots - toss in to saute a bit. Throw in some minced garlic. 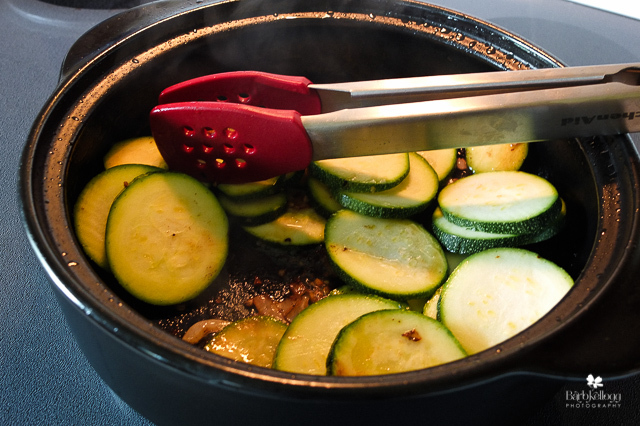 Thinly slice up the zucchini and add. Flip and stir around so it cooks somewhat evenly to whatever degree of firmness you prefer. The bacon grease has all the salt most people will need. I recommend trying your dish first before adding additional seasoning. I warmed up some leftover spaghetti, added a little olive oil and Pampered Chef Italian Seasoning and a little parm/romano/Asiago grated cheese. And then I ate it all. :) Well, not all. There was some leftover zucchini for another day.